Last night, we went to explore the Forest Service cabin. There was no one around but we could tell there were people who had set up camp there, so back to the boat we go. 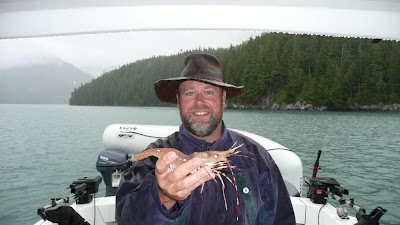 On our way out of Blind Passage, we pulled the shrimp trap and found the biggest shrimp we’ve ever caught, if not seen. I should have measured it before we cleaned it. Val and I estimated it to be about 9” from head to tail. We got half a dozen shrimp and half a dozen longistinos. (I can’t even get close enough on the spelling of this for spell-checker to help me.) 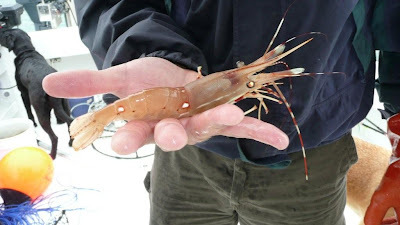 These fellas look like little tiny lobsters with really long, skinny claws. It would take several hundred to make a meal, but we kept them just for a taste. Misty Fjords is very appropriately named. During our cruise through Behm Canal yesterday it was raining all day with very low ceilings. We had to run on radar much of the time. Yesterday was the darkest, dreariest, rainiest day we’ve had yet. It was a steady downpour from before we got up until after we went to bed. Unfortunately, we couldn’t see much of the majesty we were hoping to; although, we could still get a flavor for how wild and rugged this place is. 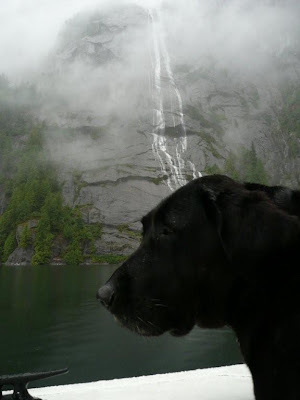 We putzed through Walker Cove stopping by numerous waterfalls which pummeled from thousands of feet into the bay. We could nose our boat as far as we dared to the cliff walls and still be in hundreds of feet of water. The charts in this area often show 1,800 feet deep…too deep for our sonar to even detect. 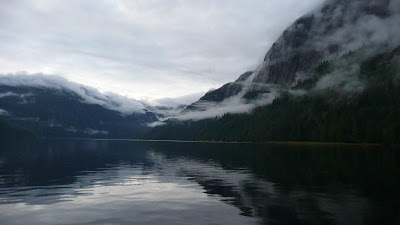 There aren’t too many places to anchor in these fjords because of the deep depths going straight down off the mountains. It’s very mysterious with all the fog layers and cloud covered peaks. It almost seems like the mountains could go all the way to heaven and the depths could go on forever. It all makes me feel pretty small and humbled. About 8-10 miles south of Walker Bay, is Punchbowl Cove, where we actually found a Forest Service mooring buoy, which we tied too. Connor and I donned our rain gear, launched the dinghy, did doggie duty, set the traps, and did a little exploring. It’s just raining too hard to stay out. When we got back to the boat, Val and Cody had dinner ready. We had our devotions, played our nightly poker (I won!) and crashed into bed early, finally! 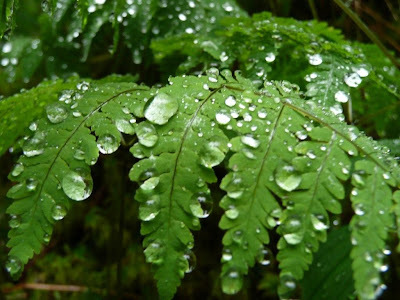 This morning, we awoke to more fog, rain and low ceilings. Nutz! We did get a momentary glimpse of the 3,000 ft. granite face that we’re moored directly under. There must be a dozen waterfalls pouring into this cove. The tide is very low today…-4’ at 9AM. This afternoon, at 3PM, it’s going to be +18’…a 23’ lift. It’s amazing how the cove changes with 23’ less water in it. Beaches that didn’t exist before are now several hundred yards wide. Rocks are poking up that didn’t appear anywhere when we explored the cove yesterday. Thank God that we haven’t hit anything. The charts in this area aren’t nearly as detailed as the ones down south. On the picture below, look at Connor vs. the high water line; which nearly touches the bottoms of the trees. Crazy! We’re going to get geared up for a hike to Punchbowl Lake. The cruising guide makes it sound like a hike similar to the one we did in Thomas Bay. Mud, rain, slipping, sliding…bring it on…let’s go! It’s gonna be a great day! Hope yours is too! 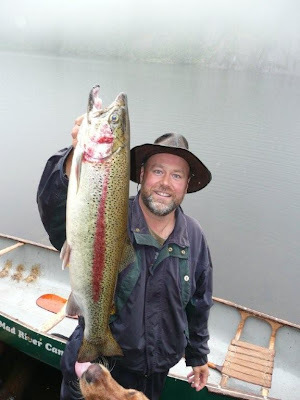 Friday Evening Update – After the boys heard about the Punchbowl Lake hike, the “pretty boys” decided they didn’t want their make-up to run, so they decided to stay back on the boat. Connor has the Narnia books he’s reading and he’s into Gilligan’s Island. We have the whole 3rd season on board. Cody has to get his school work done…its Friday. With the 23’ tide, the beach was way too long for our anchor rope and all the ropes we had on board. 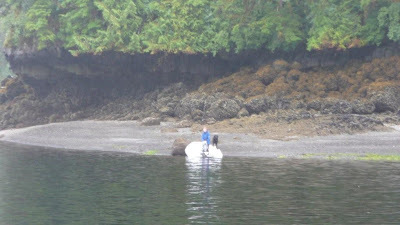 I couldn’t figure out how we were going to be able to get our dinghy back if we beached it at low tide. On the other hand, when the tide is high and it’s beached, it would be a couple hundred yards from the water. So, we took our walkie talkie and had the boys drop us off at the beach. Val and I hiked up along the creek for about an hour and a half. It wasn’t too bad of climb other than a landslide area, where we had to scratch our way up the mud, trees, and rocks. At the top, we found a canoe and a little shelter on the beautiful Punchbowl Lake. 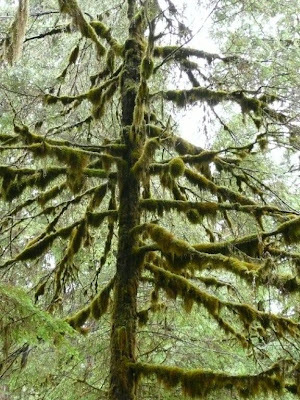 The Forest Service really did a nice job here. It felt good to get out of the rain. We met a group of kayakers from Anchorage that were there too. We got into a nice visit with John, Greg, Lenny, Jeff and Dave. I had carried Connor’s little fishing pole all the way up and I had fishing on the brain. Val wanted to stay under the shelter and visit so I launched the canoe to see what I could catch. 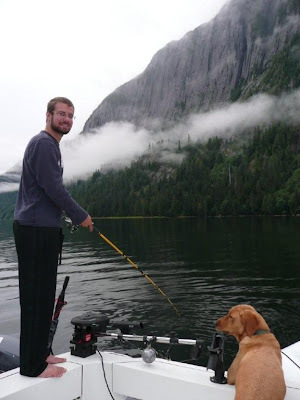 I fished along the granite cliffs enjoying the scenery even more than the fishing. I decided to go get Val. As I was landing the canoe, I reached down for the pole, which I was about to crank in, when I realized it was snagged. All of us a sudden, the snag started fighting back! I had a fish! He fought hard on Connor’s lightweight pole. I was surprised to even catch a fish. He was a big one too! I got him to the boat and he launched out of the water, flipping and spinning, and he was gone! That bugger spit the hook. Nutz! This got me fired up! I cast out again and that very next cast, wham, I had another big fish. This one fought even harder and ran the line out a couple of times before I got a look at him. This time, he launched in the air and wrapped himself up several times in the line. Not having a landing net, I figured this was my chance. I grabbed the line and yanked him the boat! What a beautiful fish. I brought him to the little shelter and Greg identified him as Rainbow Trout. Evidently, this is quite a large Rainbow. He looked like a nice size salmon with lots of pretty colors to me. This was the first Rainbow I’ve ever caught. This got Greg in the fishing mood so we went out in the canoe together while the other got a nice fire going to roast the fresh catch. Greg and I got skunked but really had a nice time enjoying the scenery and the fellowship. When we got back, the fire was ready for the fish. 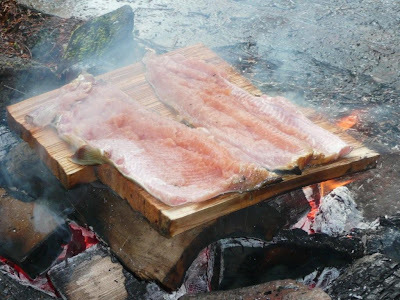 I filleted him and set him on a couple of cedar planks on the hot fire. I offered up a prayer of thanksgiving and soon, we were all sharing fresh trout cooked over an open fire up in a granite-walled alpine lake. What another great day. By early afternoon, Val and I headed back down to see if the boat was still afloat, half expecting it to be on fire or rock n’ roll music blasting through Punchbowl Cove. We called the boys on the walkie talkie to come get us. Everything was fine. It was nice to get some alone time with my bride and I think the boys enjoyed their alone time from their parents. After a nice meal of fresh halibut and crab, the boys went off fishing, discovered a sea plane had landed in front of the granite face, and decided to go off and race him when he took off again. 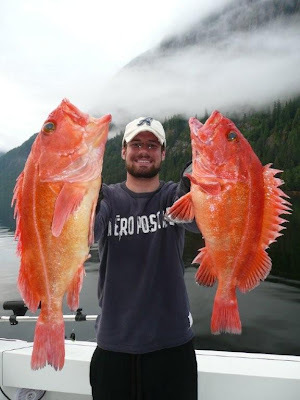 When they came back, they had caught the biggest Yellow Eye Rock Fish (Red Snapper) I’ve ever personally seen. 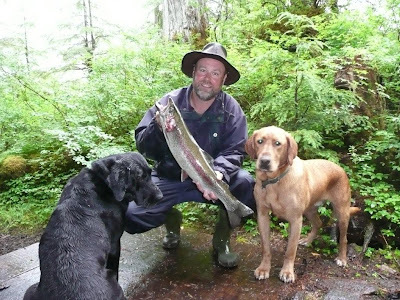 They were really amazing fish and we hadn’t caught any yet this year. I’m so glad they had a great time together and had fishing success. Well, the rain FINALLY quite. I’m glad the boys are off having fun. The marine forecast sounds great. A big high pressure is supposed to push the clouds out of here and the forecast is for record highs…84 degrees in Ketchikan on Sunday…we’ll see if it happens. Unfortunately, we’ve got to be high-tailing it home soon. 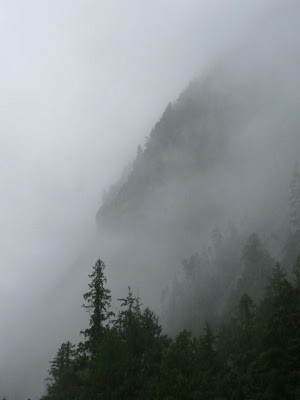 We’re still in Misty Fjords and we need to be back on Orcas Island a week from Sunday. I don’t want to go! We’ll linger here tomorrow hoping to see the mountains and then we’ll cross the border back into Canada on Sunday, or so, Lord willing.